After acquiring some aida and a set of fairly cheap embroidery silks, I decided to try my hand at cross-stitch. As with a lot of craft related activities cross-stitch and embroidery are having a resurgence. 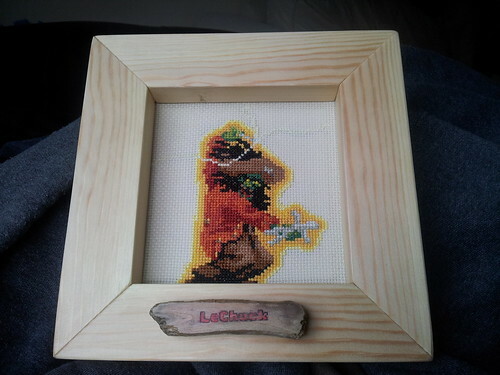 The fact that cross-stitch is essentially the first form of pixel-art makes it perfect for rendering old-school 8bit/16bit graphics. Heading over to the Sprite Database I found the sprite for LeChuck from Monkey Island 2: LeChuck’s Revenge. 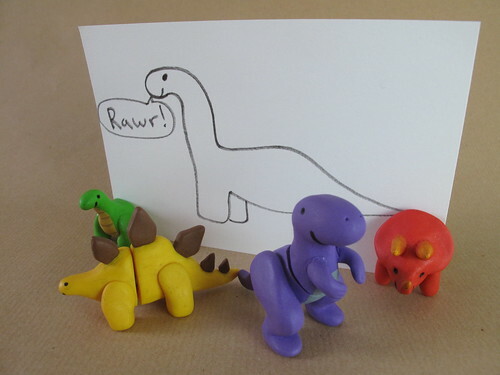 I’ve been having a little Fimo renaissance lately. 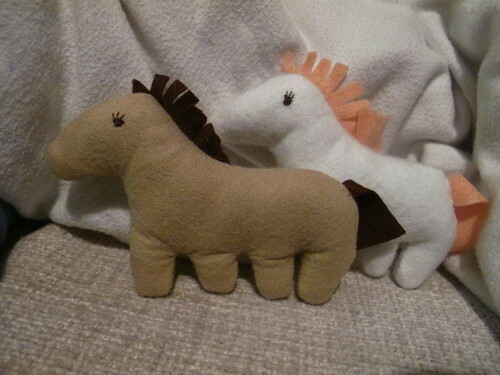 Partly due to using some Fimo for the nightlights I’ve made, but also from seeing some of the other wonderful things people like Joo Joo have made. In what is threatening to become a tradition, I made a Christmas ornament again this year. Last year I just made simple tree ornaments using sculpey and fimo. 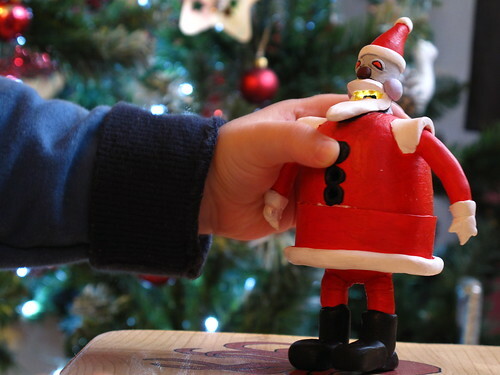 This year things got a bit more involved, as I decided to make a musical model of the Robot Santa from Futurama. 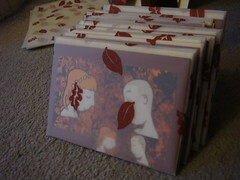 It was a good thing I started working on it in November, as it took quite a few evenings to get it all finished. About a year ago I made a table for William’s birthday. 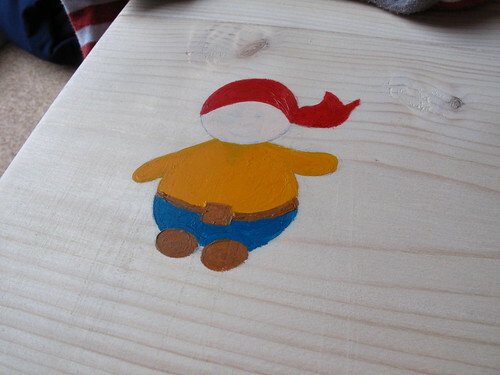 This year I decided to make him a chair to go with the table. 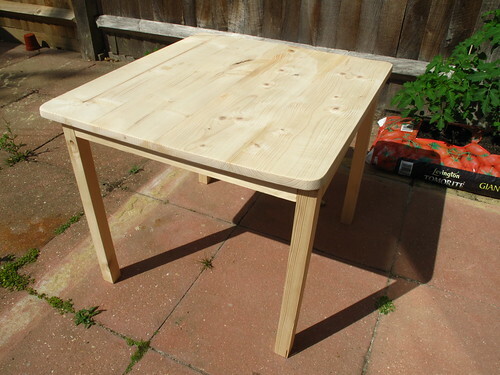 I learnt quite a bit making the table and that coupled with a few other projects (a raised bed and a small phone stand amongst others) meant that I was much more confident with my woodworking skills this time round. 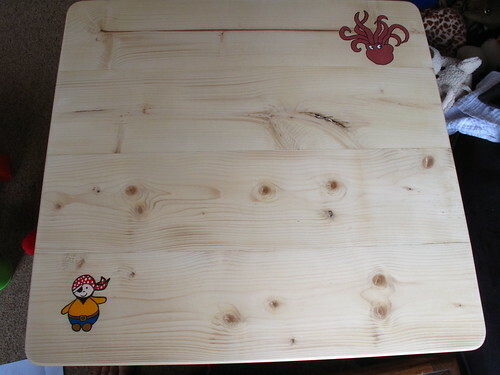 When making the table the wood for the legs was maybe a bit thin for an amateur like myself and meant I had to use screws to hold everything together. This time I chose something a bit thicker, which would make creating “proper” joints much easier. 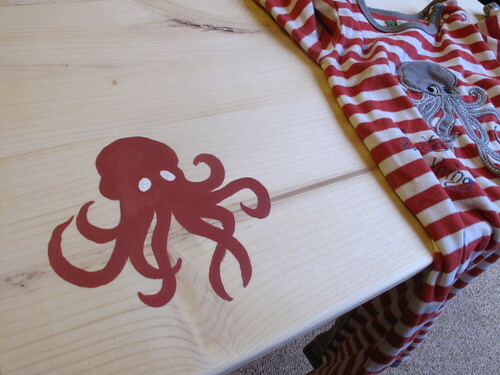 So William is a year old now and to celebrate that fact I decided to make him a table. 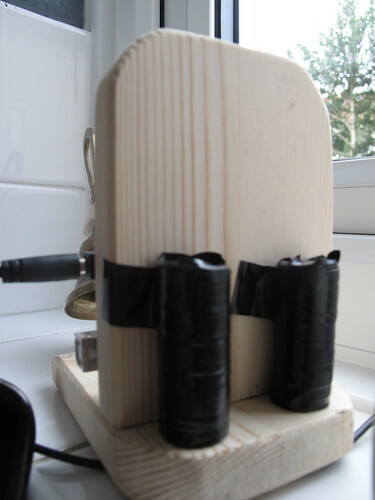 Now given that my last piece of woodwork was a doorbell, hastily constructed using a coping saw on the doorstep of the previous house, this could have gone badly. Luckily it went pretty well. 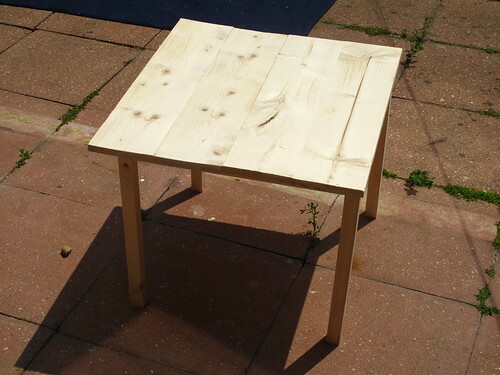 The table I’ve made has slightly wonky legs, but it’s otherwise sturdy and stable. 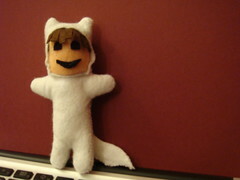 Next time I make something like this I’m going to try to do it better (of course). In particular I think I shall try and make some proper mortise and tenon joints, as they’ll help to keep things squarer. 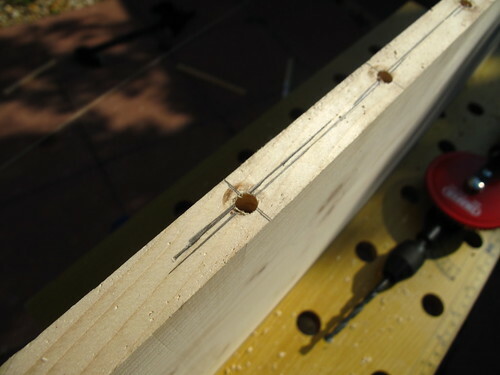 I opted to use dowels to pin the legs together, which meant the legs could move around too much before the glue set. I then had to also add in some braces to the legs, which I fixed using brass screws to provide extra rigidity and strength. 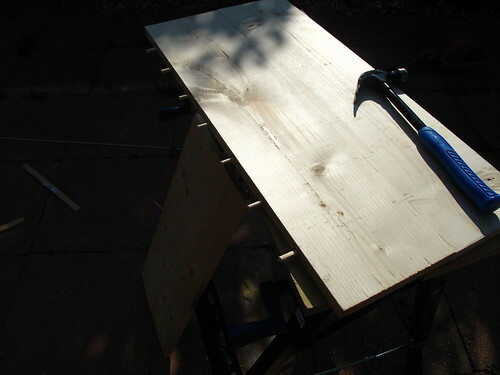 One good thing I did learn at this stage though, was that a tenon saw and a mitre block are a wonderful combination! Without them the legs would have been even wonkier. 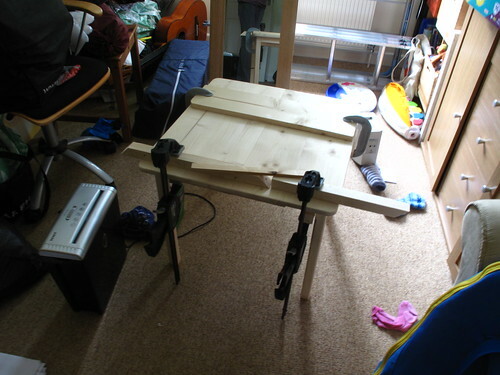 Once the leg frame was made, next step was the table top. 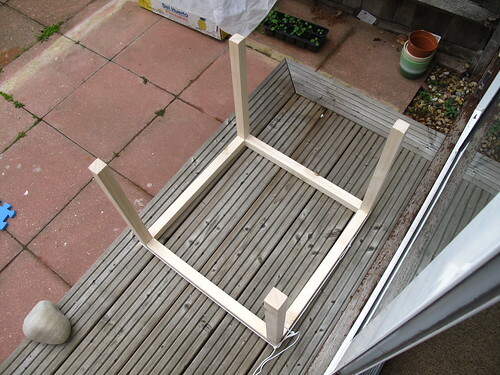 For this I leaned heavily on this guide to building a simple sturdy wooden table on the make blog. Sadly I didn’t have some of the tools used there (e.g. 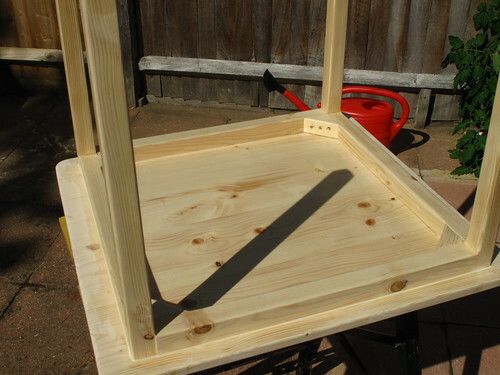 a router) so again made use of dowels to join the separate pieces of the table top together. This got easier once I also invested in a jig to help hold the drill bits steady and at 90°. With a fair bit of clamping and strapping the table top came together pretty well. Though there were some small cracks left between the pieces in a couple of spots. At this point I could then test out the table a bit. The top was a little bit wonky. 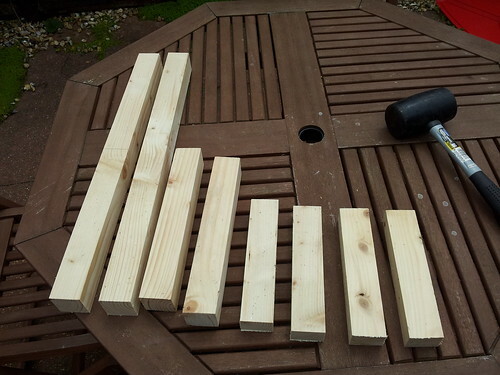 This was in large part to my poor choice of timber – I failed to check the timber was itself straight. 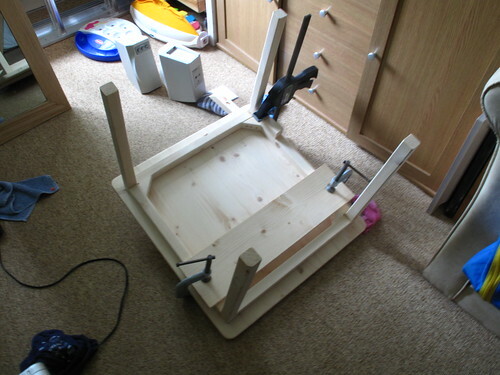 Never the less I soldiered on and clamped the table down after applying some water to one side. 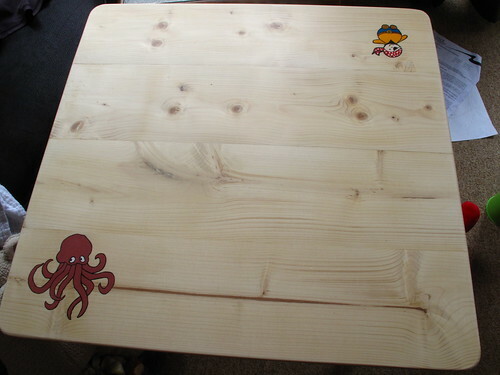 After trimming the edges and sanding the table the wonkieness was less evident and things started looking much better. 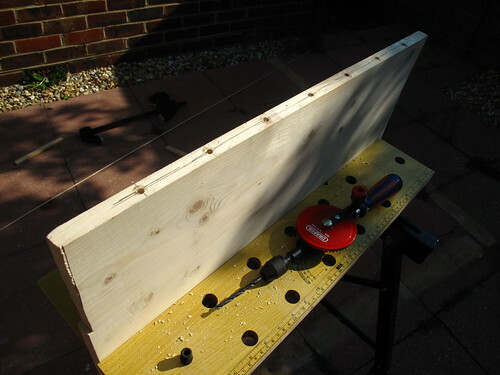 Next more holes were drilled and dowels inserted to pin the top to the frame. 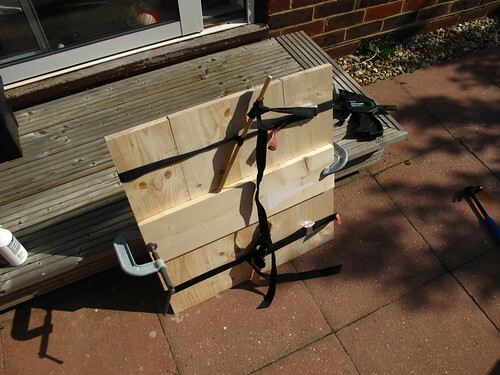 Then after the application of a whole load of glue more clamping occurred. This final clamping to the table top really helped to reduce the curve of the table top further. 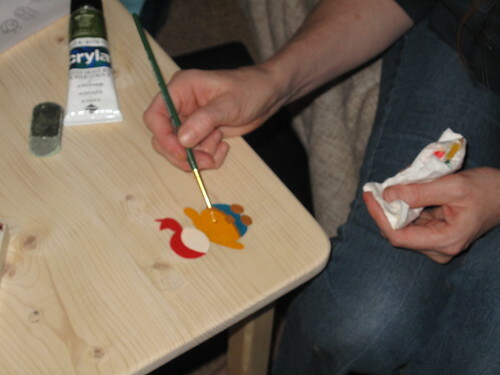 I then applied some wood filler to the cracks in the table top and also sealed off the join between the leg frame and the table top. Then after that was all dried and sanded down a coat of clear indoor varnish was applied to the legs and underside. At this point Heather and I decided it would be nice to add some pictures to the table. So we broke out the paints. 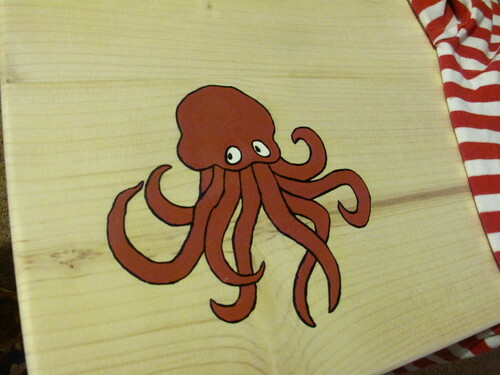 Heather painted one of William’s pirate toys and I painted an octopus/kraken that was on some of his pyjamas. 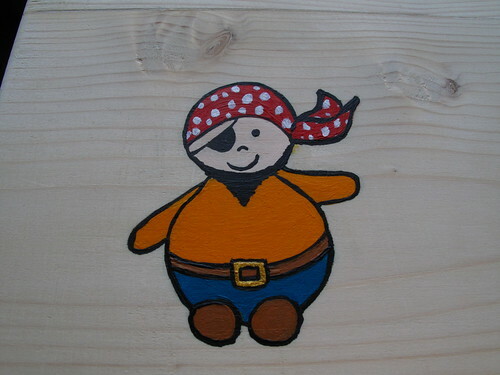 After that the top was varnished as well. We finished doing all of this just the night before William’s actual birthday. I had started with a couple of months ahead, but it always takes longer than you think. I’m very happy with the final outcome. 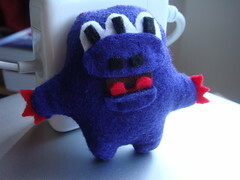 It was very satisfying making something semi-sizable with my hands. 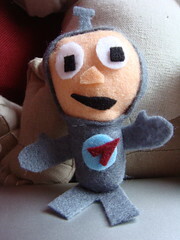 I’m also starting to acquire some better tools and a few more skills, so hopefully future projects will go even better. 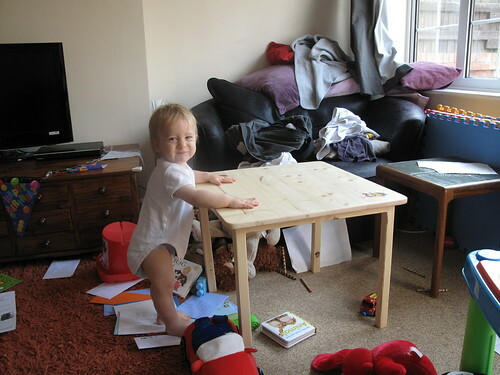 The main thing though is that William seems to like the table. 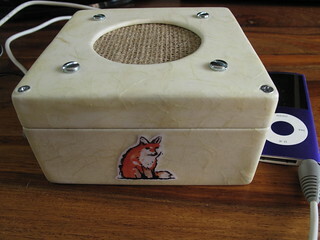 After a first couple of small Arduino projects I felt the need to make something a bit more useful and permanent. I’ve been documenting my progress on Flickr now for a while. This was about 3.1 V and 75mA output. That’s a few milliamps more than the Arduino can tolerate, so I knew I had to make sure I put a resistor (22KOhm) in between the doorbell and the Arduino. 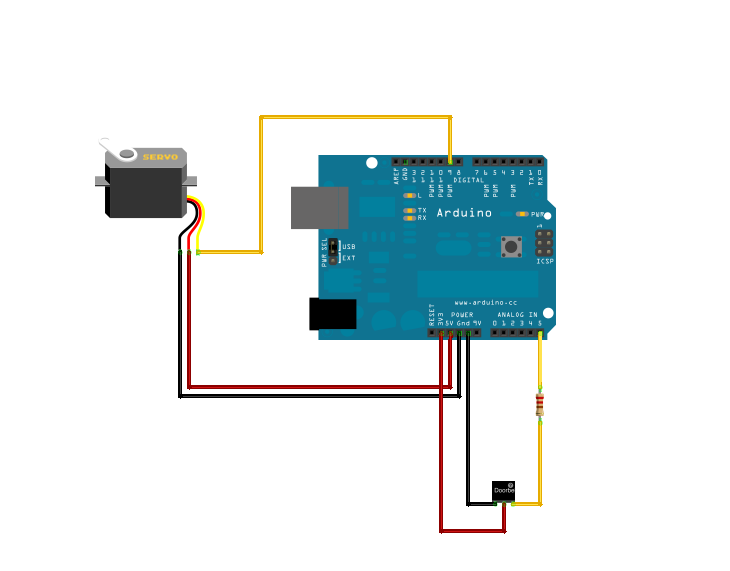 The doorbell would also need to draw power from the Arduino, but luckily the Arduino has a separate 3V output, so that wasn’t an issue. From there I verified that when the doorbell was activated I could read a drop in voltage from the wire on the doorbell labelled “SPI”. 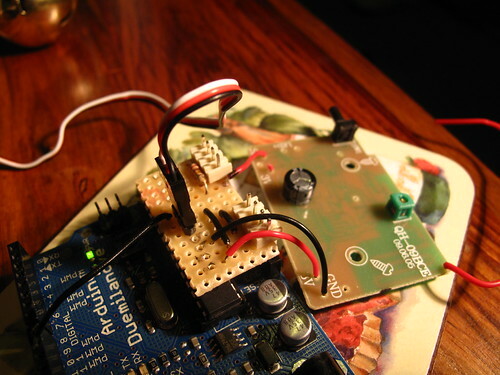 At this point I had the input for my Arduino. 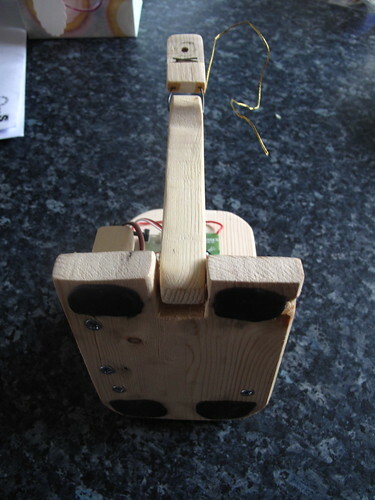 The next step was to provide some sort of audible output. Originally I had thought about just adding a buzzer, but fancied something a bit more old-fashioned. 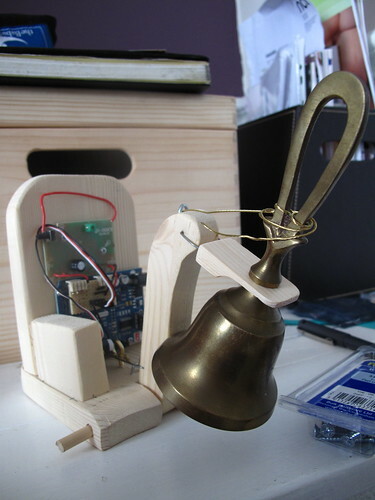 I figured it’d be good fun if the nice 21st century tech of the Arduino used some rather more ancient technology to create sound – a bell. 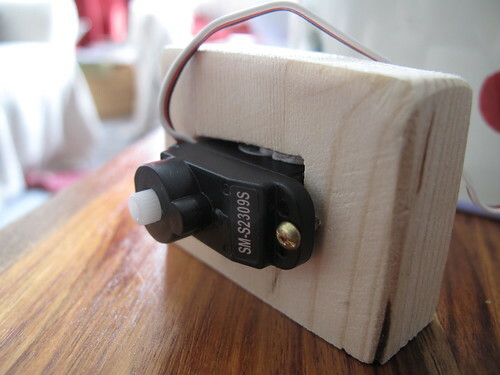 Using a micro servo from Oomlout I created a couple of prototypes. 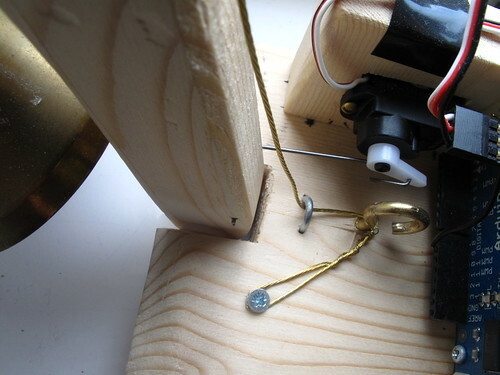 This worked, but the servo was probably louder than the bell! 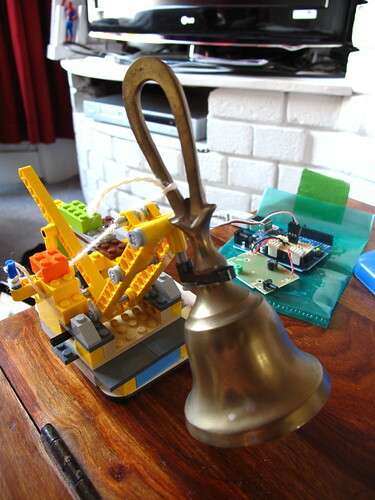 The bell is about 100g in weight, which isn’t massive, but when it’s flung around the lego prototype would tend to move too. Not so good when this will live on the kitchen window sill. So I’d need something sturdier for the finished version. As well as trying out a better bell I also made the circuit for the bell and servo more permanent, by soldering everything up on a piece of stripboard. 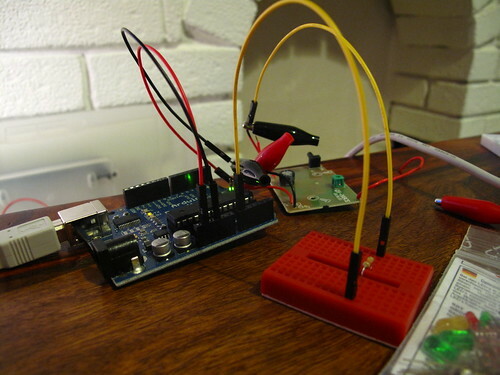 I also used a few headers, so most of the circuit would plug into the Arduino – like a rudimentary shield. The wire to the pin controlling the servo, was left to be plugged in separately. 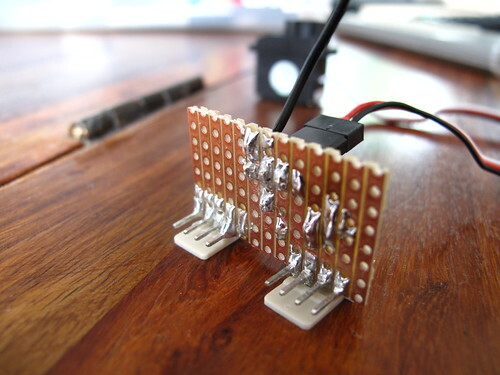 I hadn’t soldered anything since school, so I ended up swearing quite a bit trying to do this. For me it was probably the trickiest part of the whole exercise, but it did work in the end. 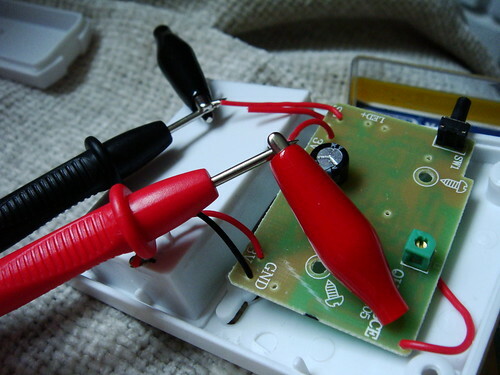 Just glad I had a multi-meter with a continuity mode to find the short-circuits – a knife worked well to clear up some of those. After the sawing and sanding was finished there was still some general tidying up to do. Eventually these will be covered up and will probably actually make up part of the internal structure of the outer decoration. This should also mean they’ll end up being attached better. For now though electrical tape has proved sufficient. 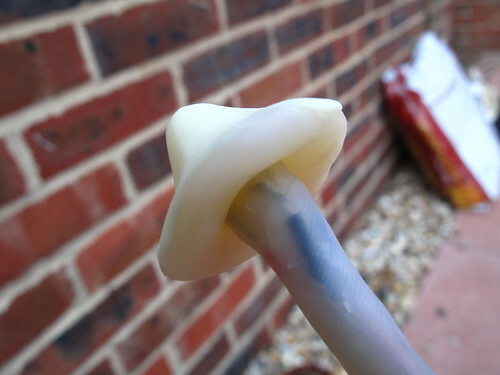 This was done to help make the movement of the arm more consistent and slightly smoother. 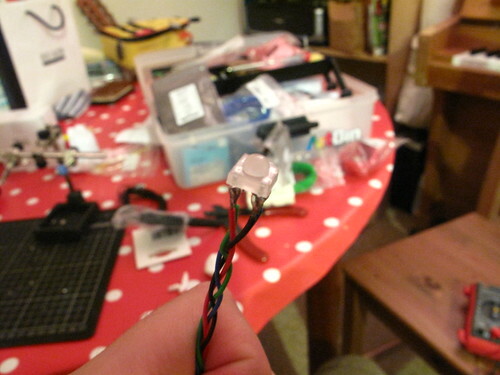 Previously I was finding that the arm would shift position slightly, which sometimes caused problems for the servo. So we now have a slightly Heath Robinson doorbell. It works better that our old one. There’s also plenty of scope for making it do more too. In fact phase two will be mostly about connecting the doorbell to my Chumby to get it communicating with the local network. 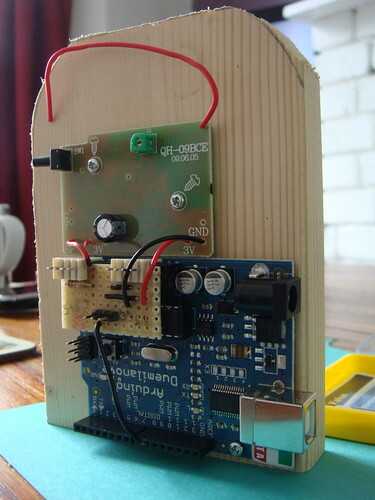 Check out my doorbell git repository on github for the code, as well as a fritzing circuit file. It’s pretty easy really. 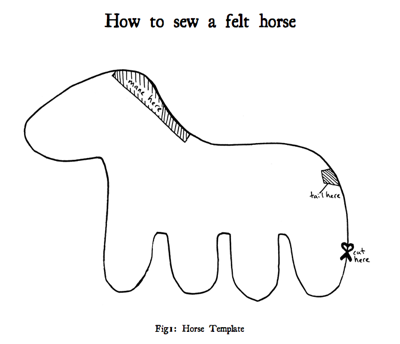 As long as you can sew some backstitch you should be able to make this easily. If not then it might not be the worst first project to try either! 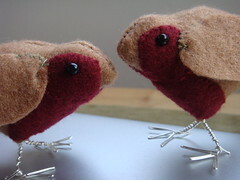 The robins are made out of felt and stuffed using bits of cut-up cotton sheet (as that was all I had to hand at the time – hence also the green cotton). 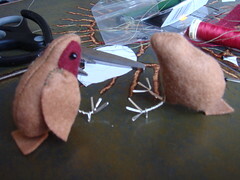 The legs are simply silver wire stitched into place inside, with the red-breast covering up the extra stitches needed. The eyes are just small black beads (from Beads Unlimited in Brighton, as was the silver wire). 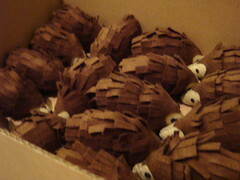 Again the hedgehogs were made of felt. 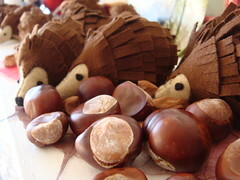 This time they were stuffed with wadding which made things easier. 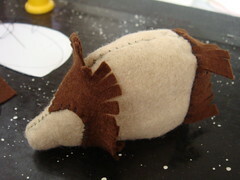 The spines were glued on as “fringed” bits of felt, with a special widows-peak shaped piece for the head. 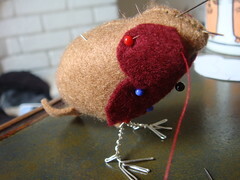 This time the eyes and nose were just small bits of black felt, glued in place – so as to be marginally more child-friendly. 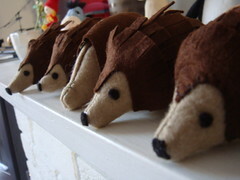 Each hedgehog body consists of three pieces of felt – two sides and a smaller bottom piece. The bottom piece makes them stand fairly levelly and also gives them a more rounded look. I realised the other day that all thirty three of these were made during a roughly two month period – meaning one felt creation every two days! Not a bad rate of productivity I guess.